The AmazonBasics 8-sheet cross-cut shredder is another cross-cut paper shredder with the capacity to shred 8 sheets of paper at a time. It can cut paper clips and staples easily rendering their removal unnecessary. It has a credit card slot so it can cut credit cards one at a time. The device weighs 10-15 pounds with a 4.1 gallon bin. Its continuous running time is 3 minutes while its cool down time is 30 minutes. This AmazonBasics product comes with an industry standard of 1 year limited warranty. If you’re not looking for anything fancy and just want to deal with basic shredding, then the AmazonBasics 8-Sheet Cross-Cut Paper and Credit Card Shredder is a perfect choice for you. It comes with no fancy features unlike other models of shredders. You can expect just what it is made for – basic simple cross-cut shredding. This model is capable of shredding multiple pages of documents at a time. As a cross-cut type, it shreds pieces diagonally and in small pieces. The shredded strips measure 3/16 by 1-27/32 inches. It beats micro-cut shredders in shredding pieces at a faster rate. I tried putting more than its 8 sheet capacity and found that it bogs down the machine and ends up in a jam when you do so. If you want the machine to shred at a faster rate, you can do so by putting in only 4 to 5 pages at a time. Clearly, I can only recommend this for home or personal users where tasks would be expectedly light. Do not choose this model if you’re thinking of getting a shredder for commercial or industrial use. This model of cross-cut paper shredder is able to shred pieces diagonally and into small pieces typical of its type. This gives me the security and peace of mind whenever I use the device in shredding my ATM receipts, financial bills, and other personal documents with sensitive info. I have also checked the shredded pieces to make sure that they cannot be reconstructed and I think it is sufficient. In my opinion, the strips are cut too small to make them even readable. I’d be really surprised if anyone would be able to do anything with them. Its capacity of shredding 8 sheets at a time makes the model ideal for home, personal, or light use. This makes it the best choice when you need to consider security, convenience, and budget altogether. The device has dimensions of 12.8 x 7.3 x 15.9 inches. It is light, compact, portable, and easy to move. The side handle is positioned just right at its current place. Its body can be fit perfectly in small offices or home spaces. It comes in an attractive and professional design so it will also make your workplace look just as professional and sophisticated. You can place it almost anywhere. But the tradeoff of having a small size body is that it naturally comes with smaller capacity. This is particularly when it comes to its waste basket capacity. What this mean is users will have to empty their baskets more frequently. Expect this to be the case if you are a regular shredder. It would be really great, though, if AmazonBasics can partner this model with bigger baskets to address this problem. But then again this may also mean that having smaller units lead to unnecessary spills or clutter whenever you empty the basket into the recycle bag. Although I’ve noticed some instances where there were airborne filters as I dumped the waste container. Mainly because this model is best used for its basic shredding purposes limited to its declared capacity, this cross-cut shredder provides the users creativity on how to make the most out of it. In my case, I decided that the waste paper will be perfect for my recycling practice. I could just easily save up all the waste paper and put them to good use come winter time. Instead of spending for fire bricks, I can recycle all the waste paper as winter fire starter. This is a great way not just to save money but also to be environmentally responsible. As with other types of cross-cut shredders, expect some level of noise every time you put the shredder into use. This model shreds at 70 dB noise level, noisier than your regular strip-cut shredders but it’s not as noisy as the older units. You may have to sit through your TV show or radio listening with some struggle or patience as the machine works in the background. 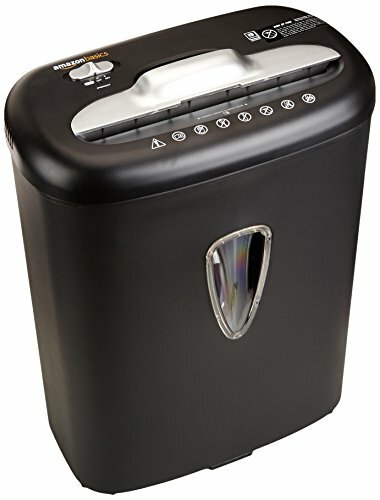 If you don’t mind the high level of noise and the relatively small bin size, the AmazonBasics 8-Sheet Cross-Cut Paper and Credit Card Shredder is excellent for limited personal or office use. We're on your favorite social networks, sharing tips to help you to keep your personal information secure.